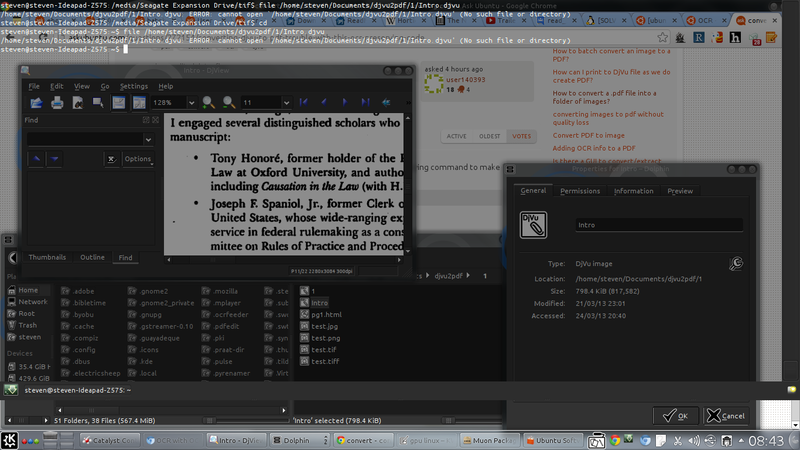 I want to convert djvu to pdf while preserving OCR. This page describes how to do so, but I am getting a blank html file. *** [1-11711] Failed to open 'Intro.djvu': No such file or directory. it just runs on an indefinite loop. The OCR file opens fine. I fixed the file /home/steven/Documents/djvu2pdf/1/Intro.djvu. Turns out all my djvu files had no extensions, but linux was opening them anyways. This will not run "in an infinite loop" but will just wait for standard input (keyboard in your case), since you are not running sed with an argument or as a part of a pipe. sed does not know which file you want to process. Not the answer you're looking for? Browse other questions tagged pdf convert ocr djvu or ask your own question. Comment & Highlight the PDF & DJVU files?